Eager to make up a lost Monday practice where rain drenched the Brickyard, Tuesday presented a much more preferable opportunity for IndyCar drivers and teams to acquaint themselves with the Indianapolis Motor Speedway. For the latest session, 36 of the drivers entered for the 2010 Indy 500 have clocked lap times for Tuesday's preparations. Ending the two-day reign of Team Penske and Helio Castroneves as the supreme ruler of practice, close pursuer Target/Chip Ganassi Racing rose to the top of the speed charts for Tuesday. 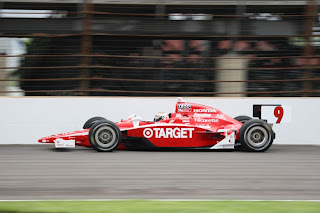 Scott Dixon in the #9 Target car jetted on the day with a 226.549 mile per hour lap time in the afternoon. Slower than the over 227 mile per hour mark set by Helio Castroneves on Sunday, Dixon's pace was performed within cooler 57 degree Fahrenheit ambient temperatures. While only a slight deviation from Sunday's 61 Fahrenheit temperatures, this attributed to the slower speeds compared to the weekend's best lap times. Emerging as a surprising presence in 2nd place, Mario Moraes in the #32 KV Racing Technology car clocked a speed 0.1119 seconds than Dixon. Still unwilling to rest on his laurels, Moraes maintains the mindset that him and his team still has room for improvement. Planning to lean down the car for simulated qualifying runs tomorrow, Mario Moraes is looking forward to the Indy 500 Pole Day qualifying on Saturday. "I think the new format is great. I'm pretty confident that we have a car to get into the top nine. I'm pretty confident we can get into the field on the first day. I'm not sure if we have a car for the pole, but if we do then we will be fighting for that." Reflecting on the Tuesday practice, the Penske Racing cars lacked the pizazz of the weekend. After leading practice on the first two days, Helio Castroneves was devoted down to 8th with teammate Will Power one position behind him. Ryan Briscoe, the lowest placed member of the race team following the Tuesday session in 19th spot, brought to light the method to Penske Racing's plan of the day. 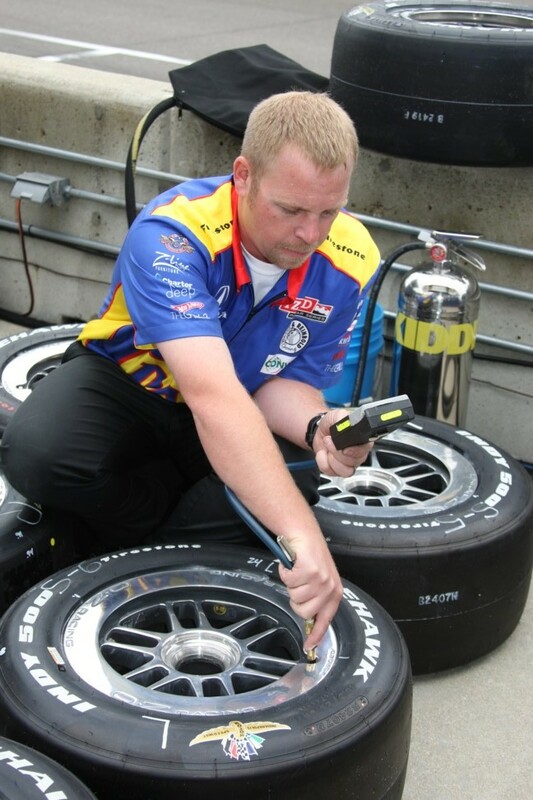 "We were able to run lots of laps. We did some runs with Will, getting a feel for how the car behaves in traffic." Briscoe said in post-practice as his other teammate implied the same race pace strategy. 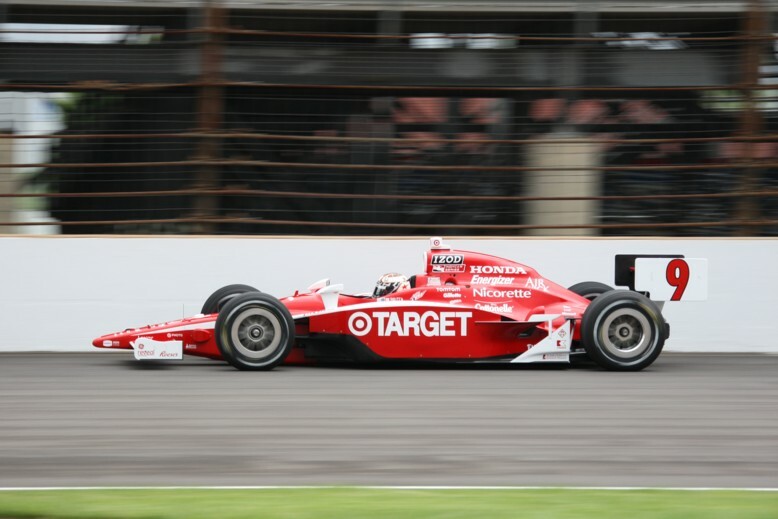 Continuing their resurgence in 2010, the Andretti Autosport team has enjoyed a productive time at the Indianapolis Motor Speedway. Marco Andretti led the squad Following the last Saturday's practice session where Tony Kanaan gauged the entire five-car Andretti Autosport race stable, the team's most senior driver has enjoyed a third straight practice ending in the top 10 of the time chart. Kanaan placed 6th fastest for Tuesday in his #11 car but claimed to their was little to learn from the cool session. Kanaan is looking forward to warmer weather tomorrow as a more conclusive day for preparing their a car for Indy 500 Pole Day. Deeper down in the practice time results were Ryan Hunter-Reay in 17th and Danica Patrick in 30th place. Patrick run 61 laps in her #7 car being 1 of 6 drivers who have completed more than 60 laps on Tuesday. Circulating for the most laps, Dale Coyne Racing's #19 vehicle driven by Alex Lloyd logged 81 laps (the equivalent of 202.5 miles). While Moraes led the four-car KV Racing Technology contingent at Indy for Tuesday, Paul Tracy also recorded a strong session placing just outside of today's top 10 vehicles. Seemingly mirroring the efforts of the #32 car, Paul Tracy responded after running his #15 car saying "We had a pretty good day for the GEICO KVRT car. We stuck to our plan of working on race setup." In only his second day of practice, Tagliani and the FAZZT Race Team #77 car rose to 4th place on the time chart thanks to a 225.394 mile per hour best lap time. "The car is running fast and the boys are doing a great job. Our speeds and our potential are all attributed to the meticulous preparation of the B & W car that the guys have done and the hard work of the engineers." Tagliani complimented the effort as a team result. While the #77 car completed an additional 27 laps for Tuesday, the FAZZT Race Team's second car intended to be driven by Brazilian driver Bruno Junqueira has yet to make an appearance for the Indy 500 preparations of 2010. As Wednesday is expected to be a warmer and settled day, tomorrow should feature a consistent chorus of Honda racing engines running within the Indianapolis Motor Speedway.